I find food photography incredibly humbling. 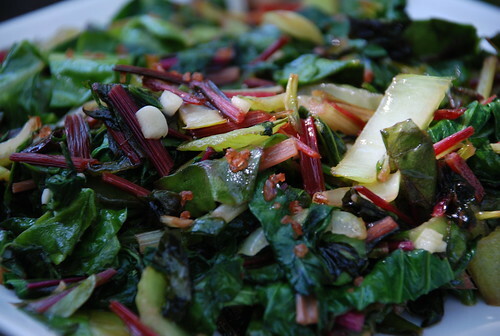 This afternoon, I decided to try capturing the particular sparkle of red salt on local greens. 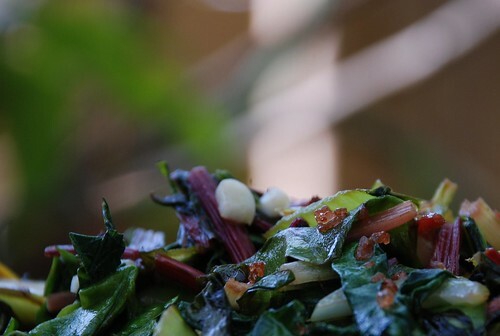 Green and red are color opposites, and the glossy salt jumps off matte rainbow chard (the word ‘chard’ even sounds matte). I liked the center of the photo with the red salt heart against the leaves, so I drew the lens closer for less plate in the shot below. The greens looked alive, but almost too green, so I turned the plate for more purplishness and less light bouncing from the left side. and finally, the salt started the sparkle—not in the center, but (geek out with me for a moment) at a bottom corner of the center quadrant using the Rule of Thirds. Only the best I can manage for you, delightful kthread readers, as I explore the complicated world of shutter speeds and sunlight. 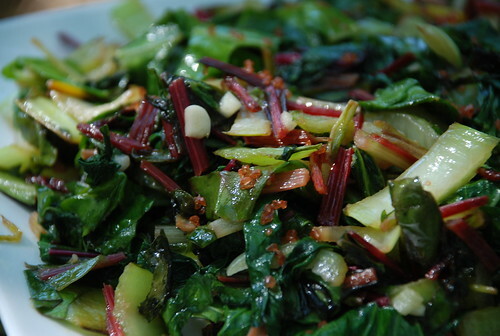 To make this, sauté one clove chopped garlic in a tablespoon of oil or other fat; add chopped stems of one bunch of baby chard and one head of bok choy. Cook, stirring, for three minutes over medium-high heat. 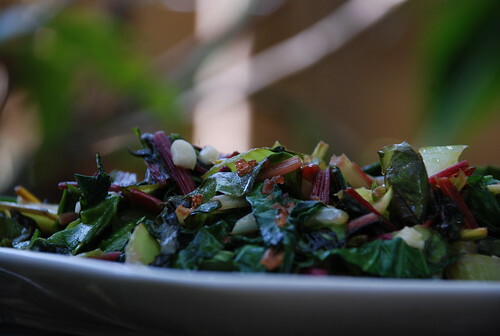 Add the chopped leafy parts, stir one minute longer. Season with finishing salt or Tamari. Ooh, so many colors from such a simple dish. 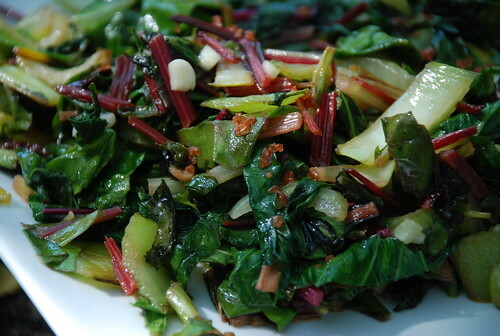 I can’t wait to try it, though I’m not sure if “baby chard” exists in the Midwest. I’ll have to go on a quest for delicate greens and finishing salt.